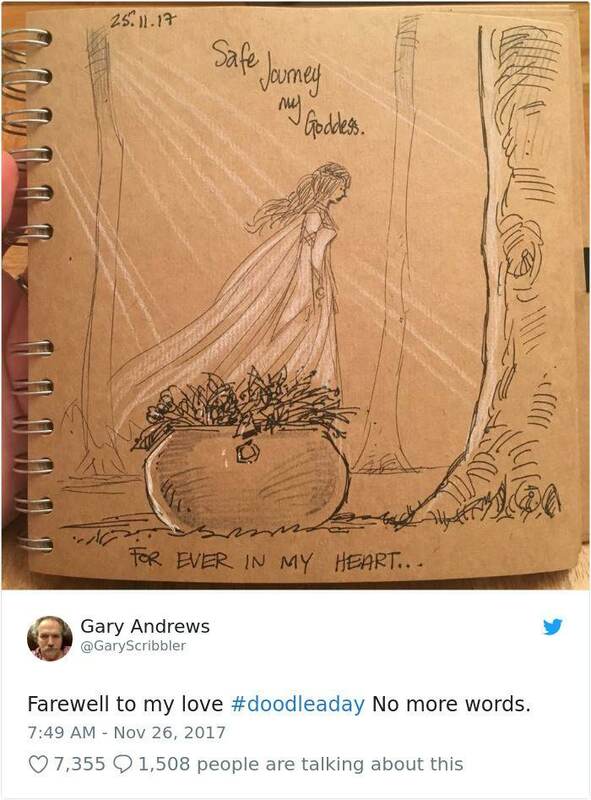 A lot of people keep diaries and I'm sure every woman as a teenager kept a diary to express her feelings and thoughts when she couldn't tell her secrets to anybody. 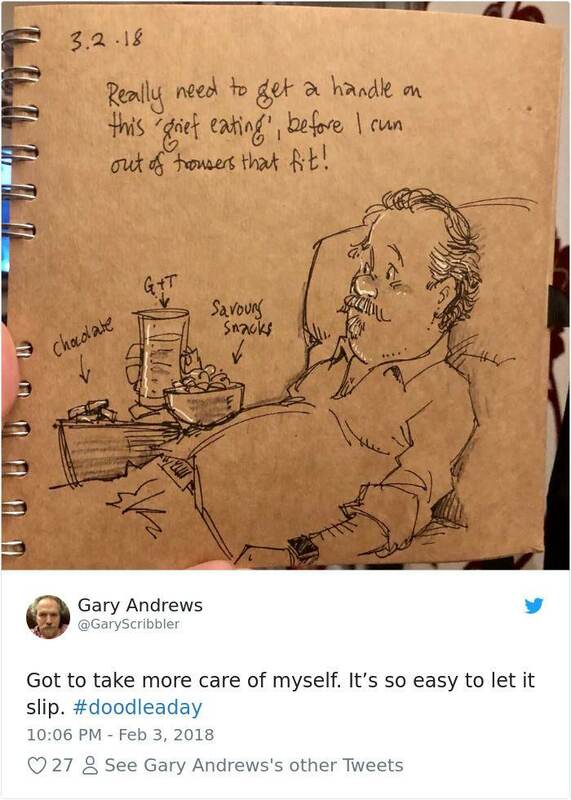 Those were the good days, but still today there are people that believe in journaling every detail of their lives, whether it's to remember when they are old or to just focus their feelings on the positive things in life. 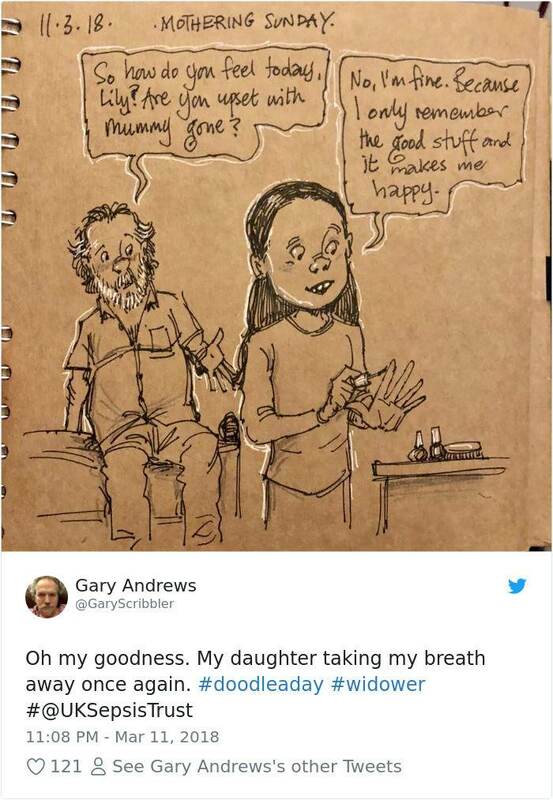 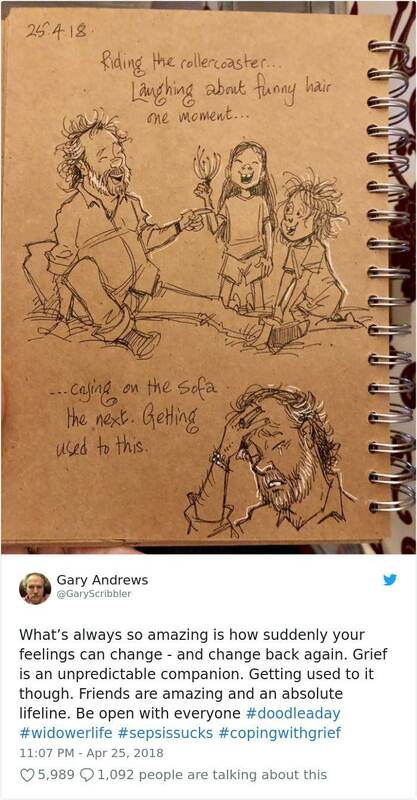 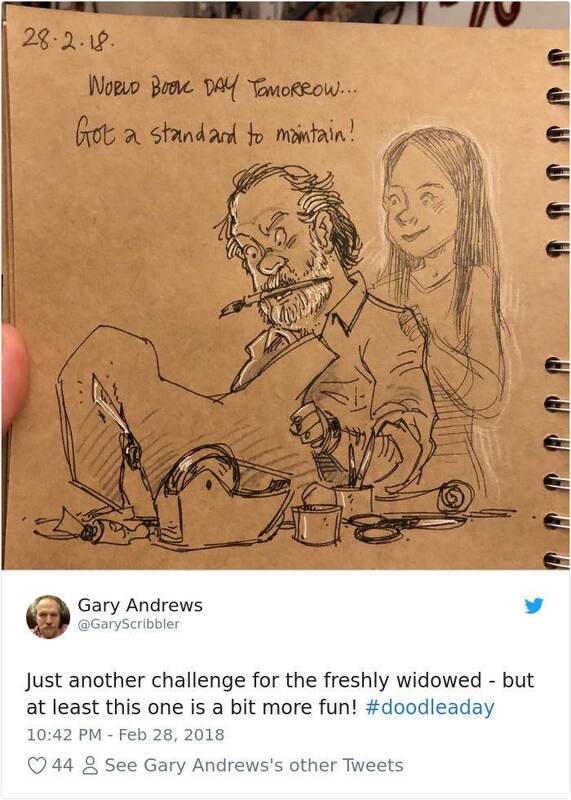 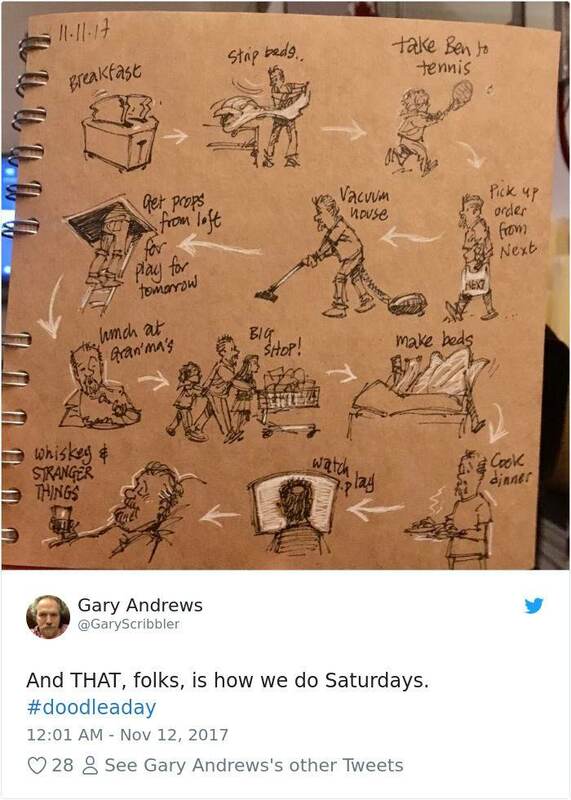 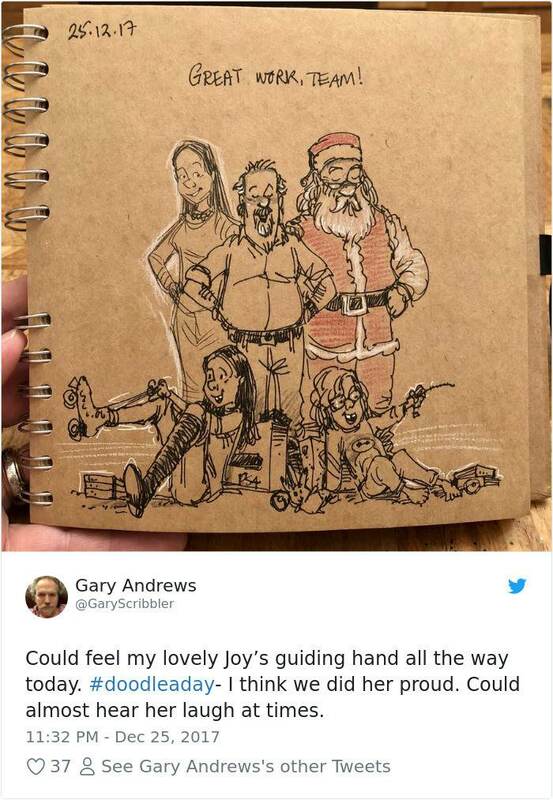 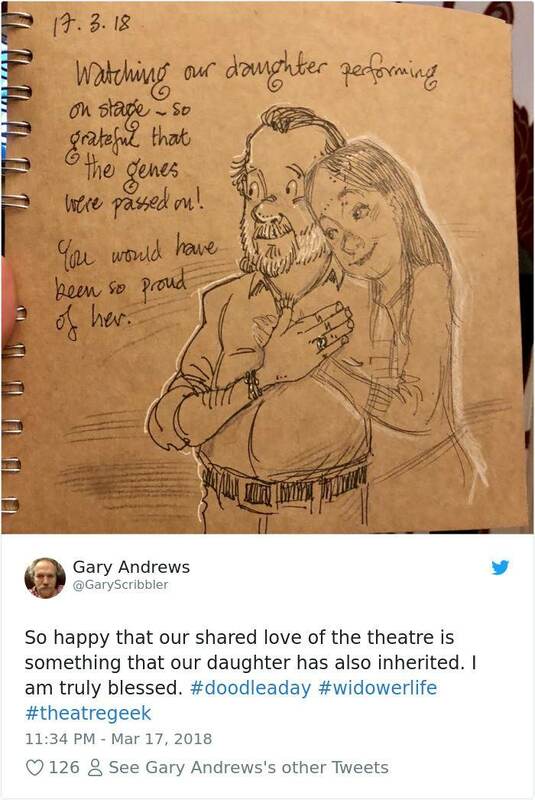 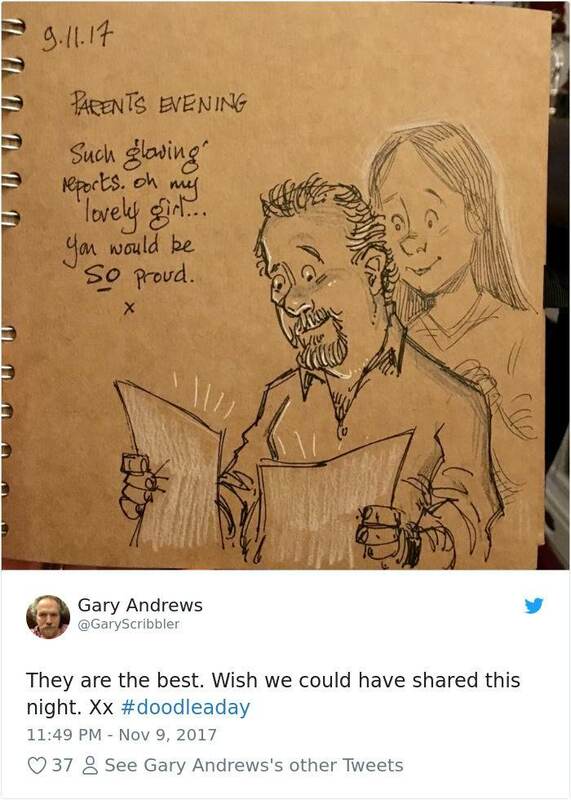 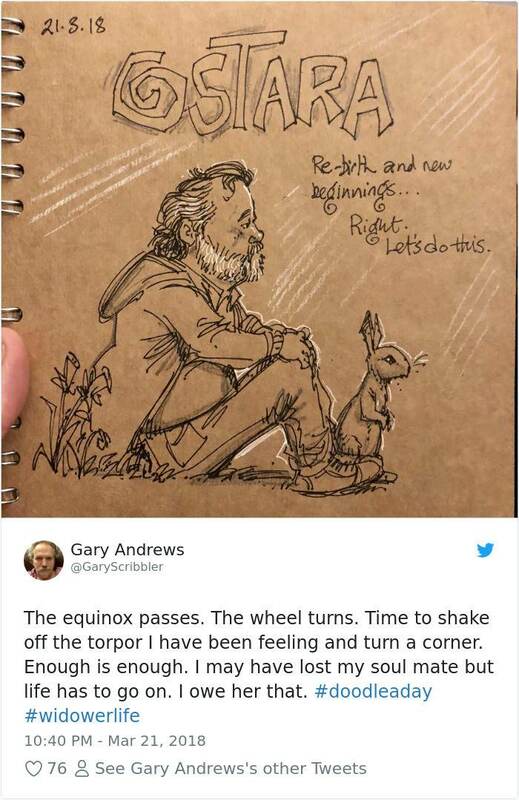 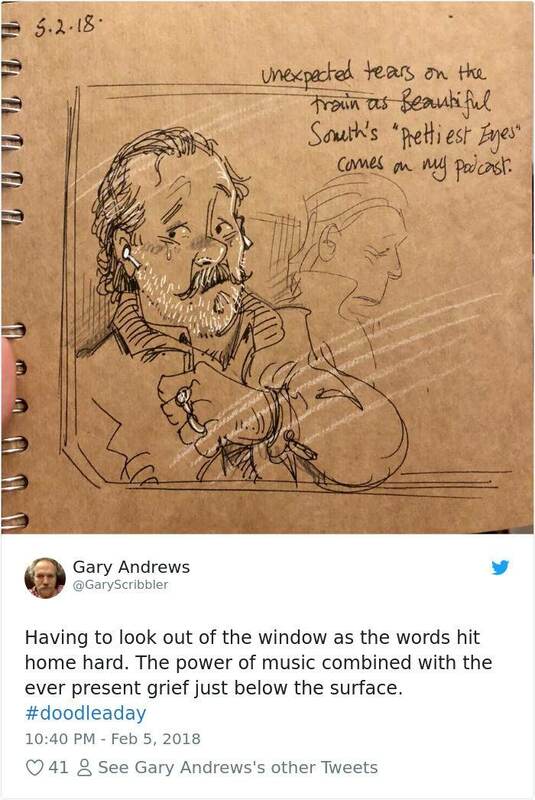 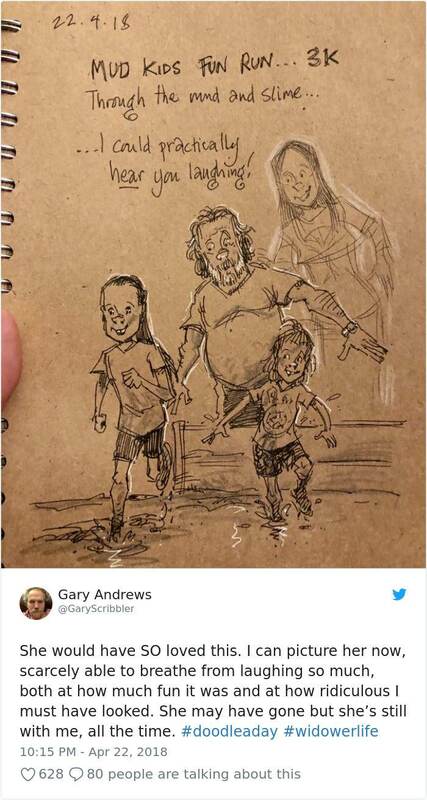 This is exactly what Gary Andrews, former Disney illustrator does. 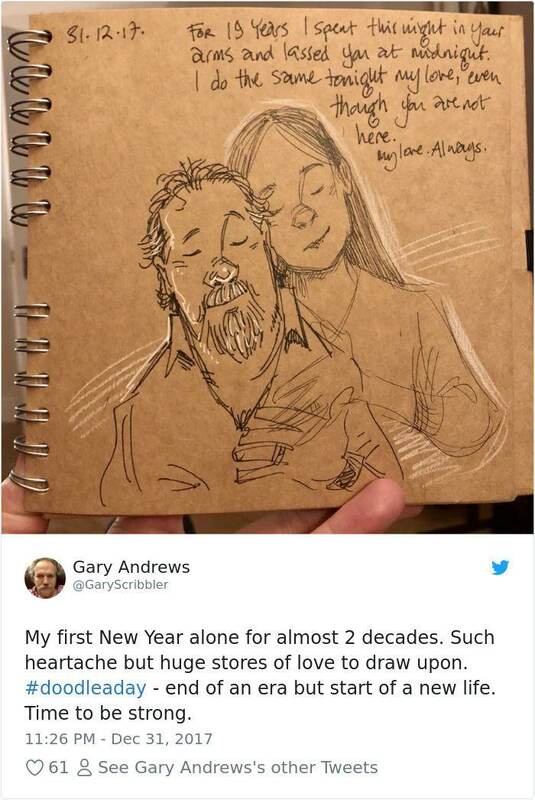 He started doing it on his 54th birthday, but instead of writing, he drew pictures and scenarios of himself, his children and his beautiful wife. 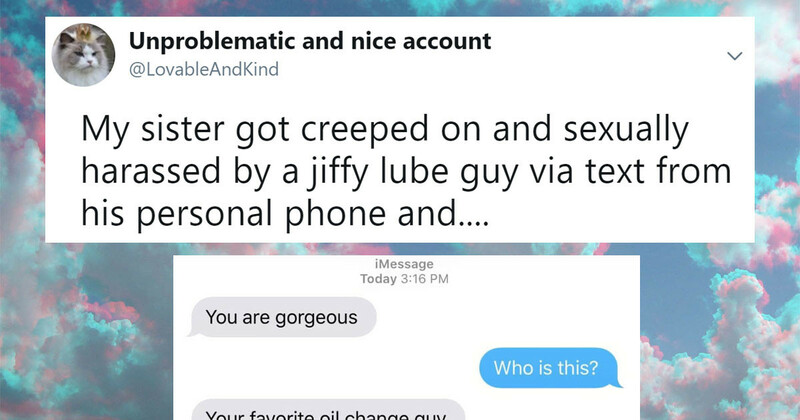 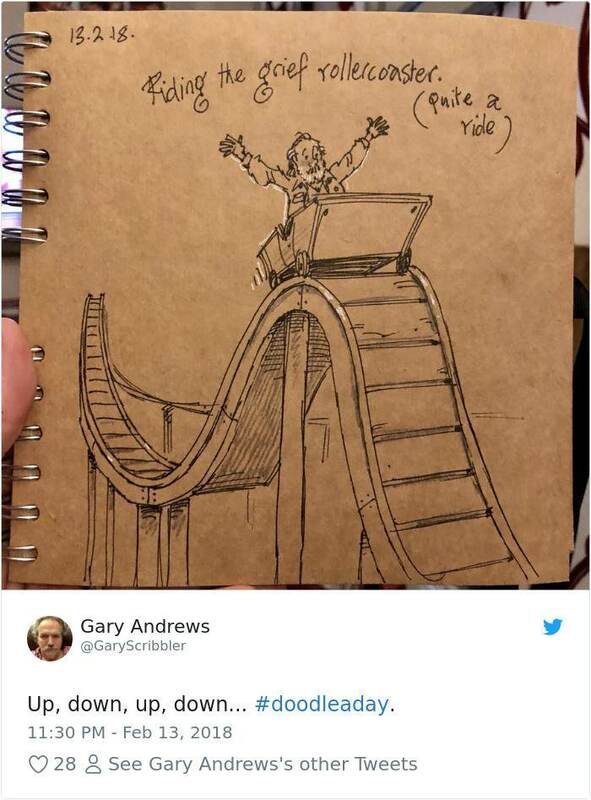 Little did Gary know that his life was going to change forever! 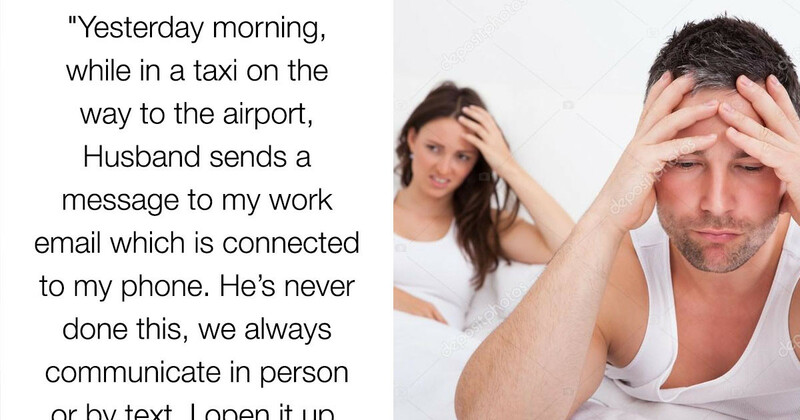 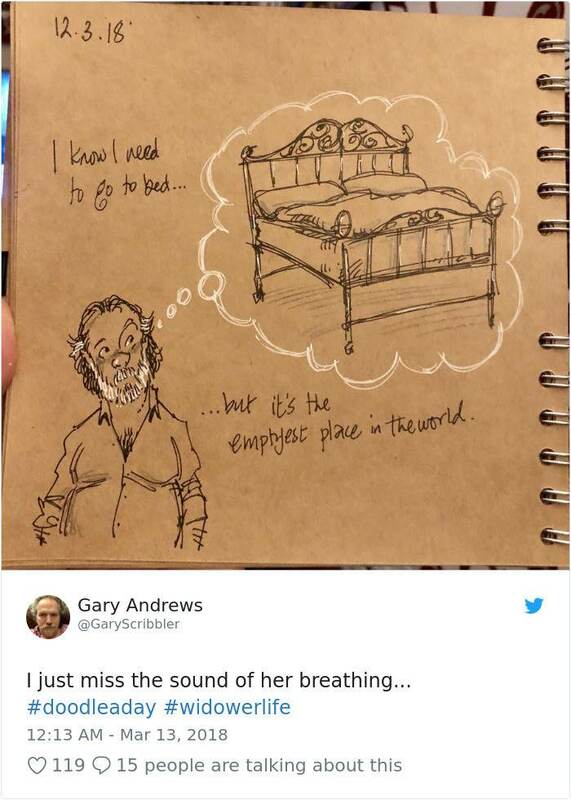 He was in Canada for work and while he was there his wife got terribly sick and they thought she just had a bad case of the flu. 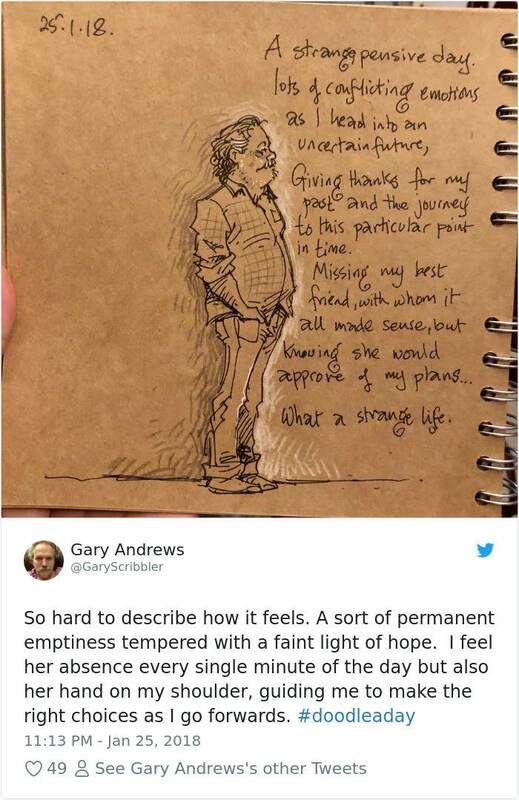 But they later realized she had a serious condition and Gary immediately got on a plane back to the UK to support his wife. 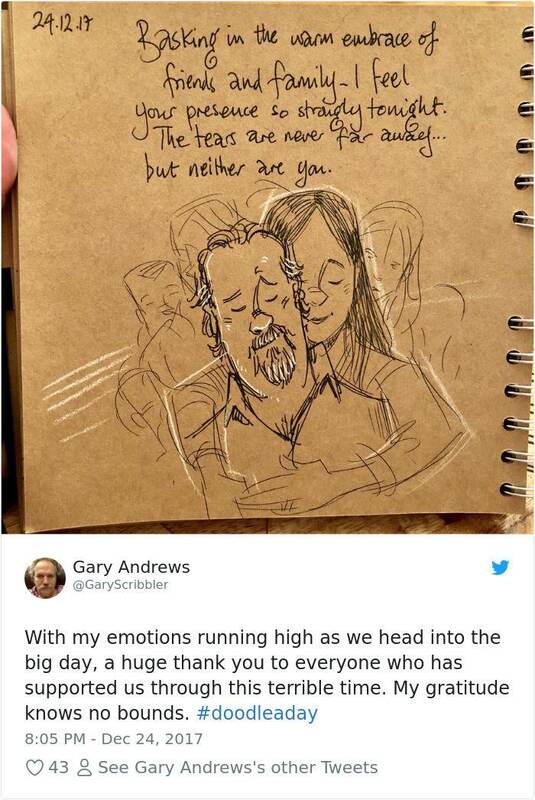 Unfortunately, he arrived too late and was informed that she passed away from Sepsis upon his arrival at the UK airport. 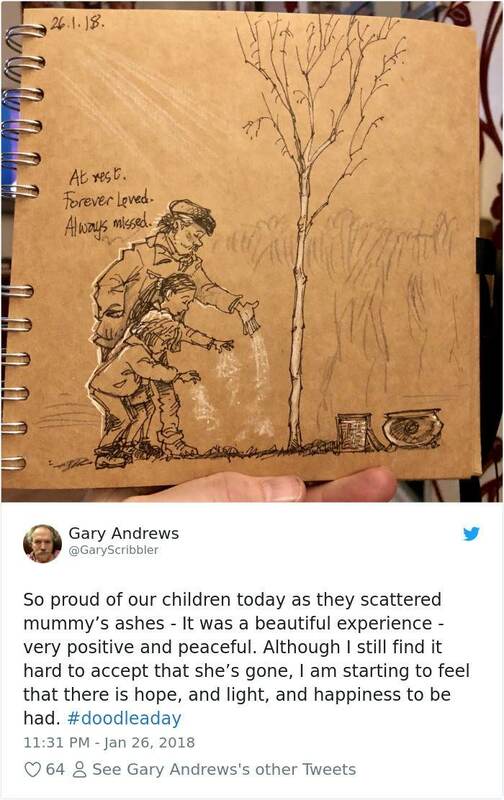 This left Gary utterly devastated, because not only was his wife deceased, it also happened so quickly that he was still in massive shock. 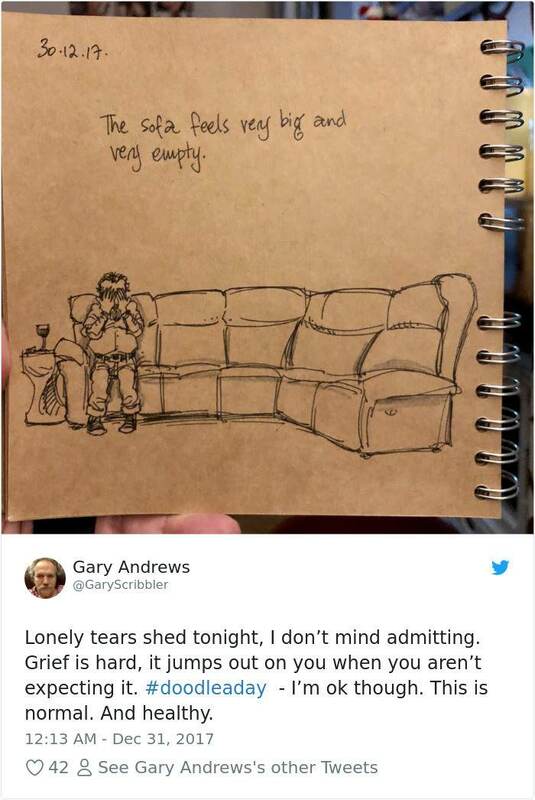 He struggled to grieve and let his feelings out, so he did the thing he knew best. 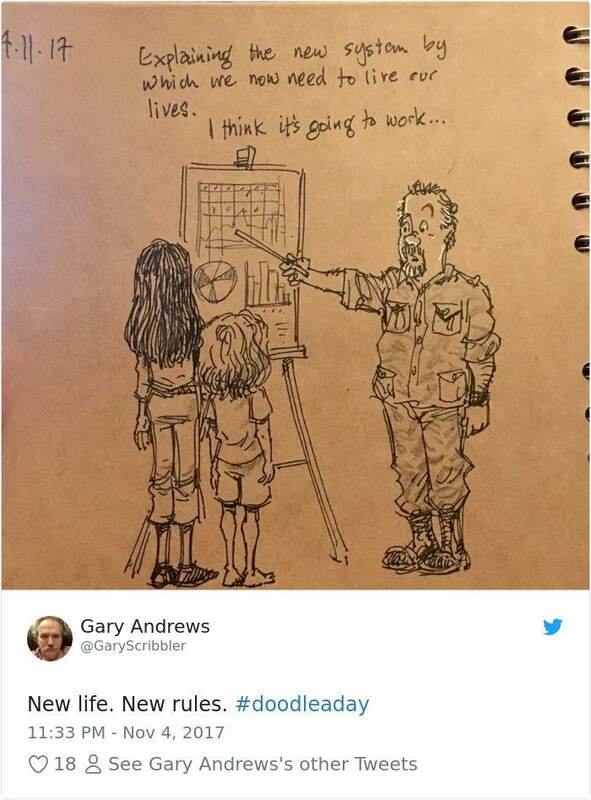 He opened his notebook and started drawing. 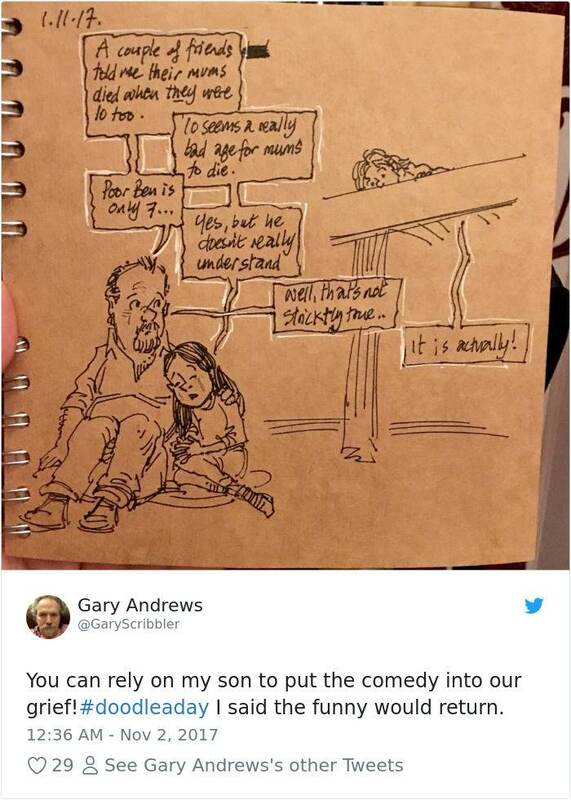 "I was crying so hard it was difficult to focus on the page. 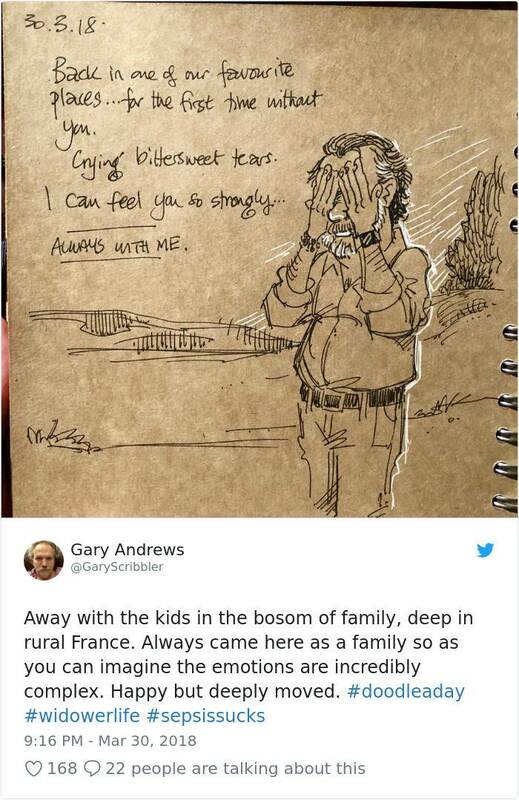 I was drawing through tears," he said. 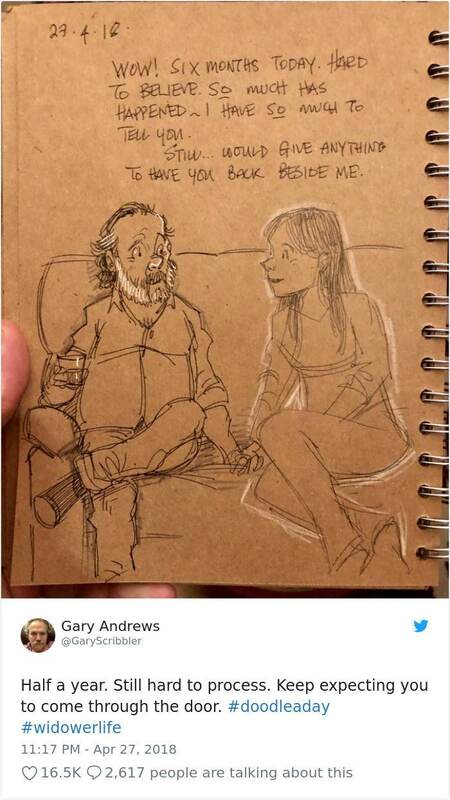 "Joy had been my soulmate for 19 years. 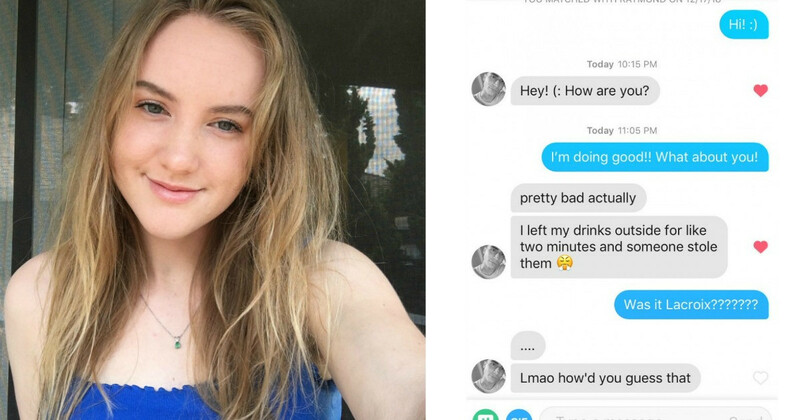 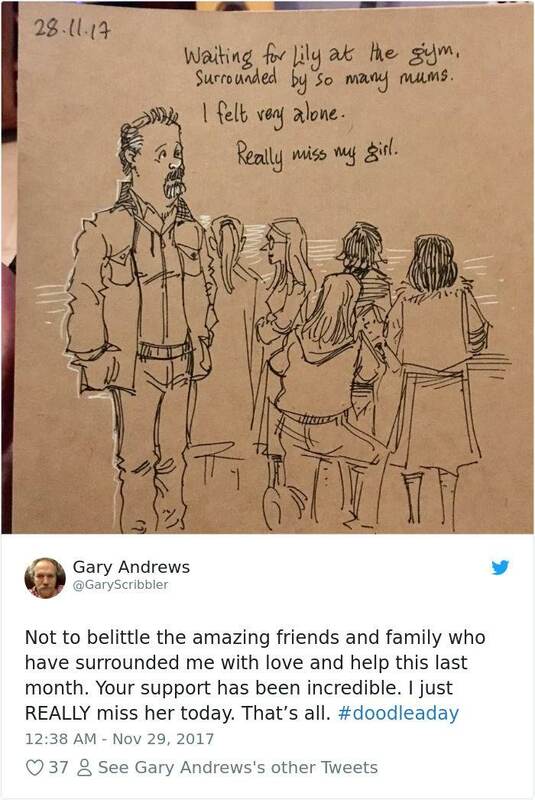 She was beautiful, kind, generous and funny. 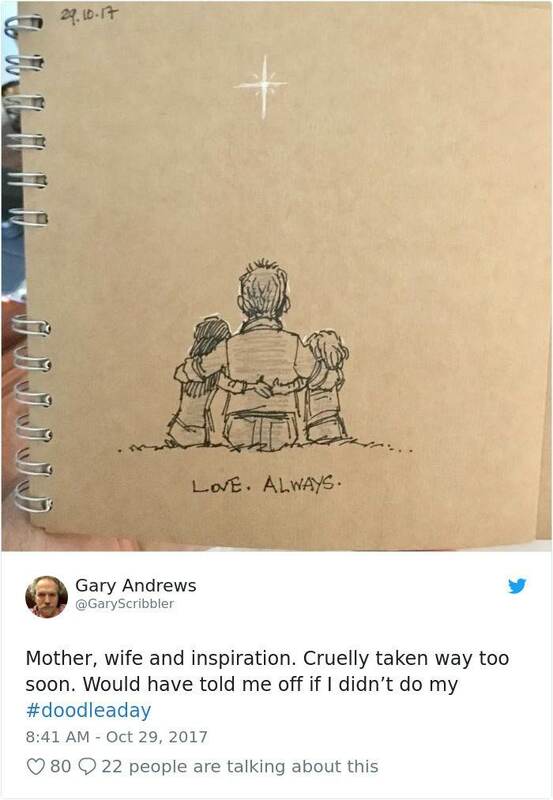 We did everything together. 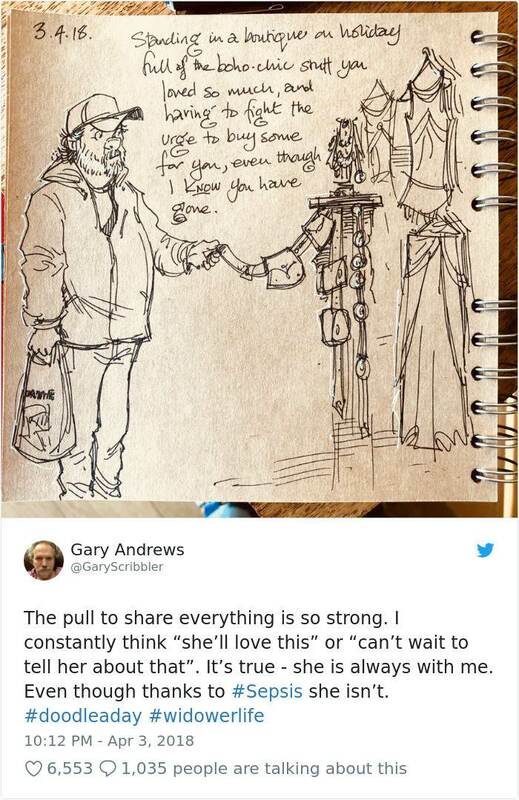 When I lost her, I felt half of me had gone." 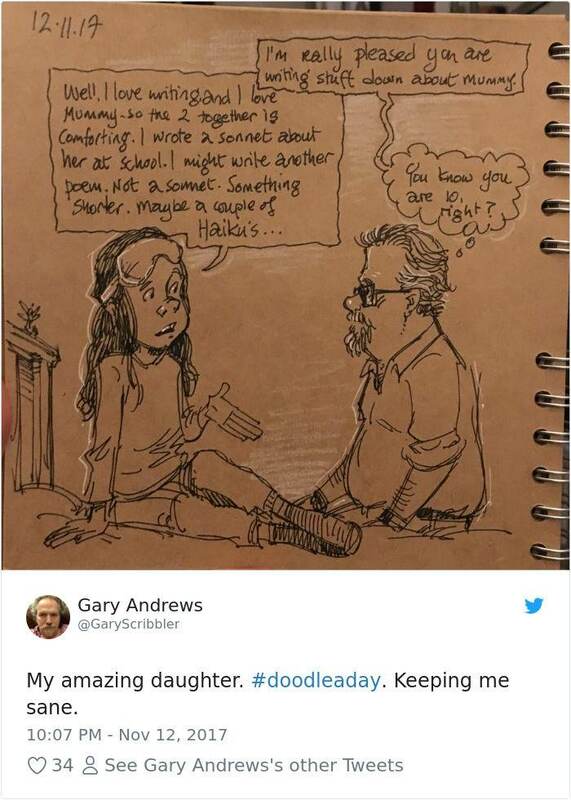 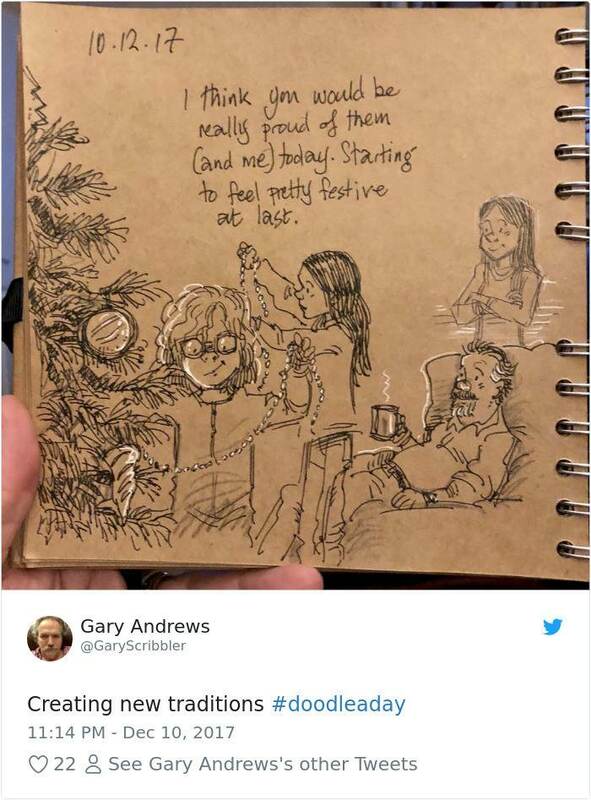 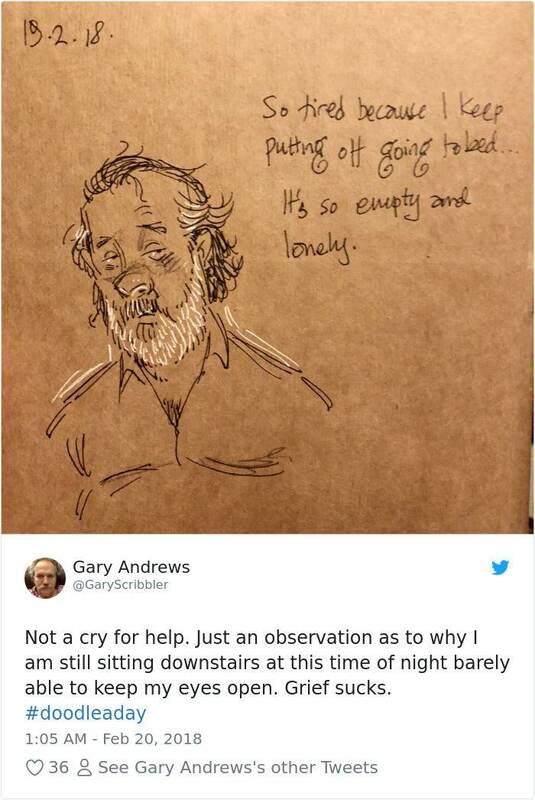 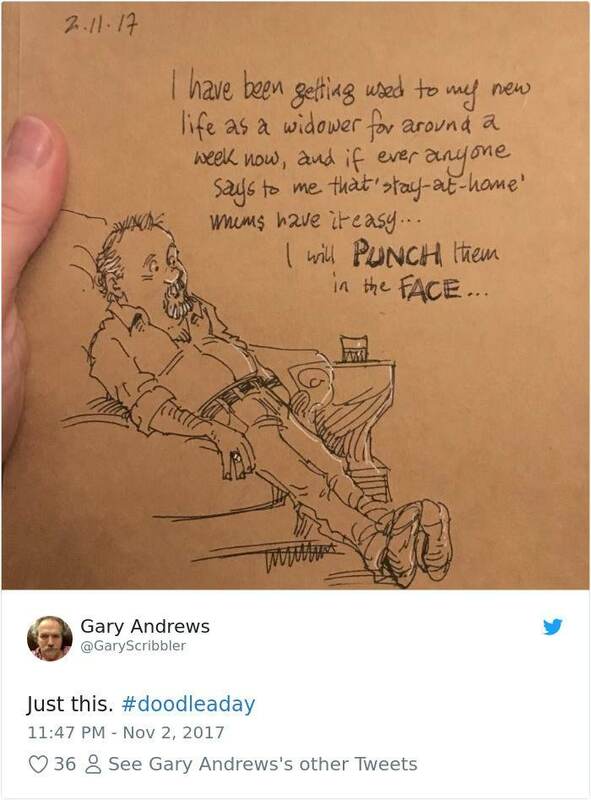 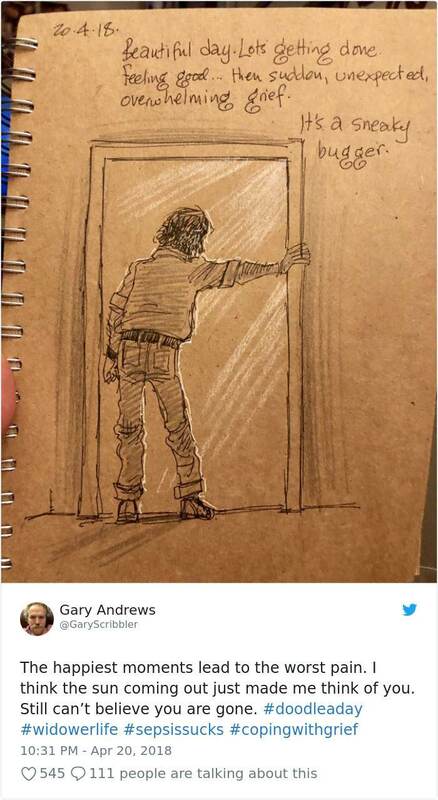 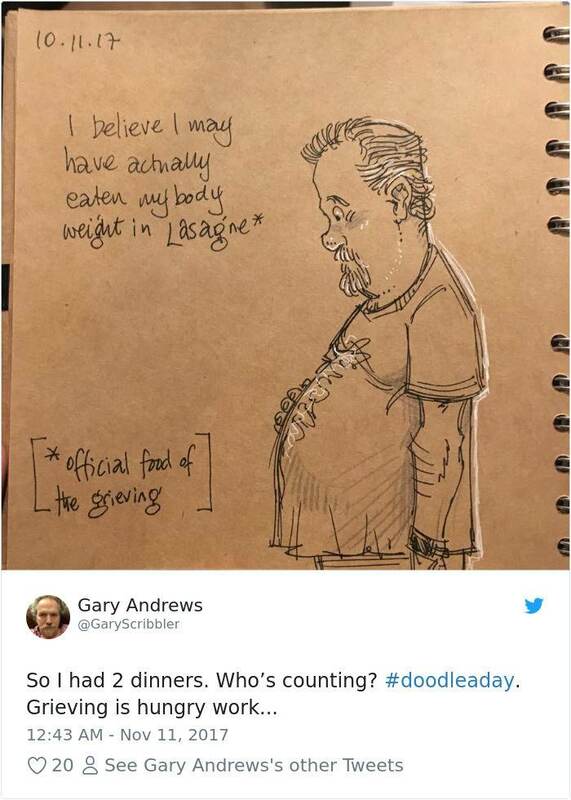 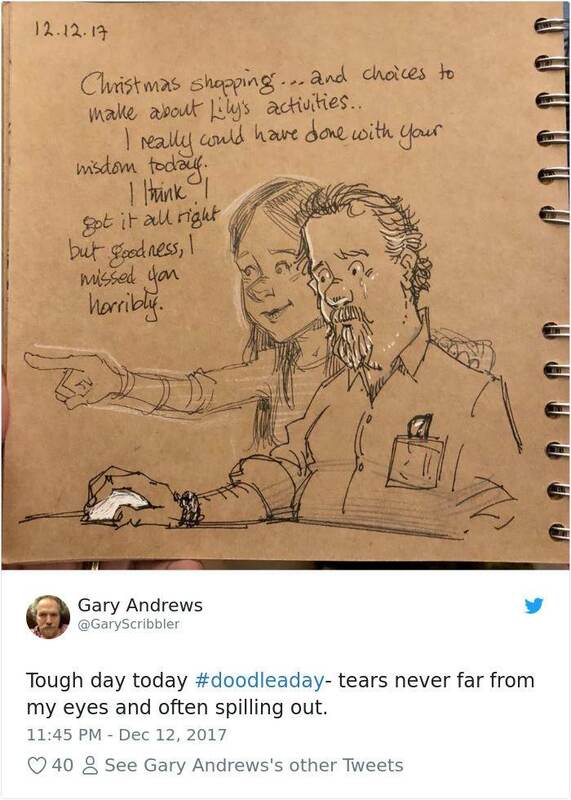 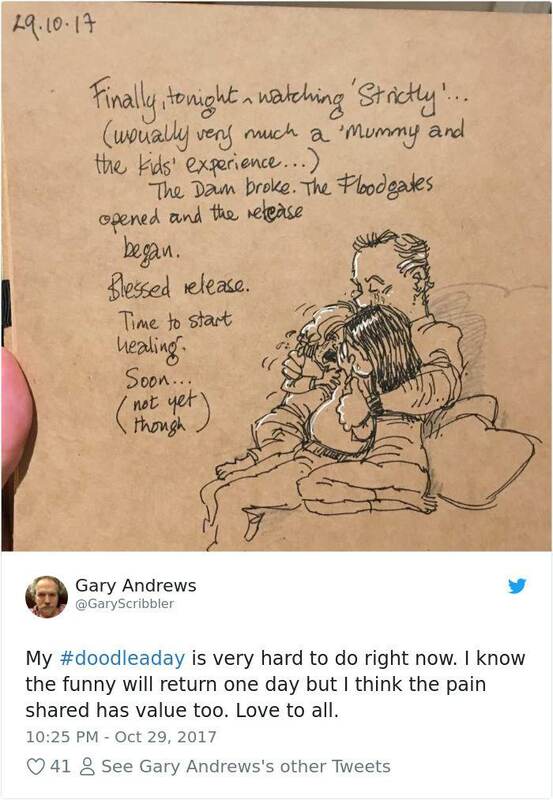 To this day Gary is still grieving and using his doodles to soothe his mind, heart, and feelings. 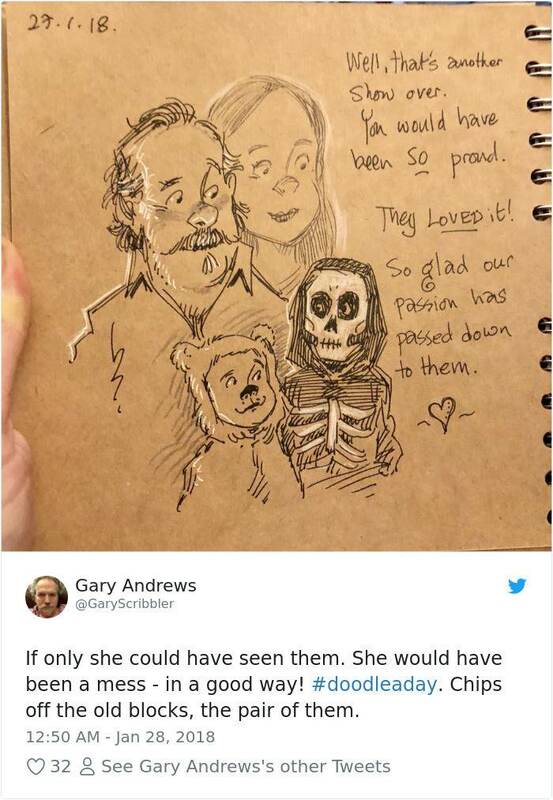 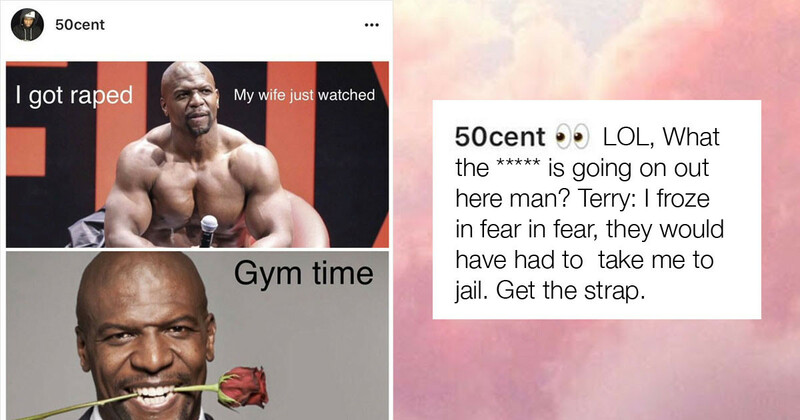 It is a way for him to express himself and his drawings regularly include his wife and what it's like being a single parent and raising daughters without their mother. 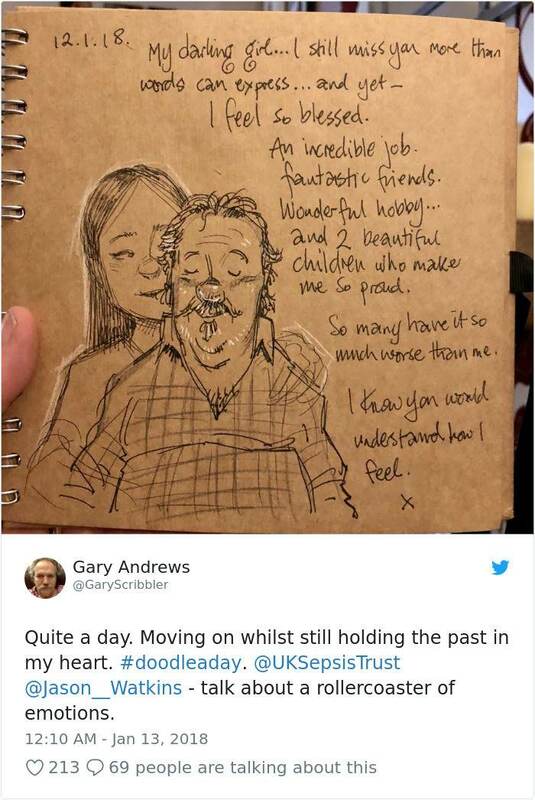 Gary's only hope now is to raise awareness on the silent killer that is Sepsis. 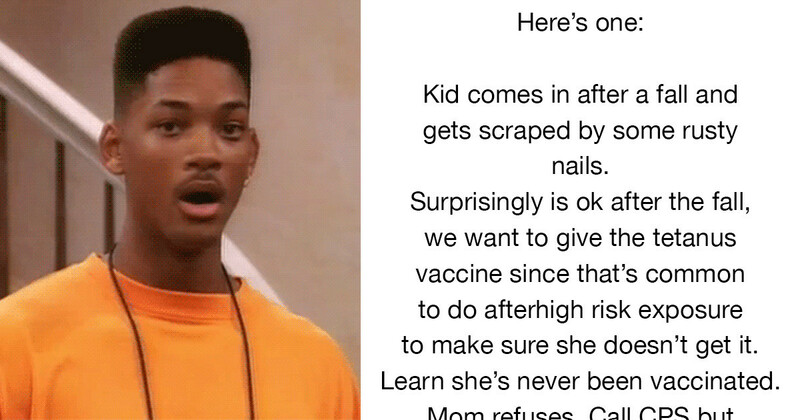 It is masked by the symptoms of the flu and is only caught when it's too late. 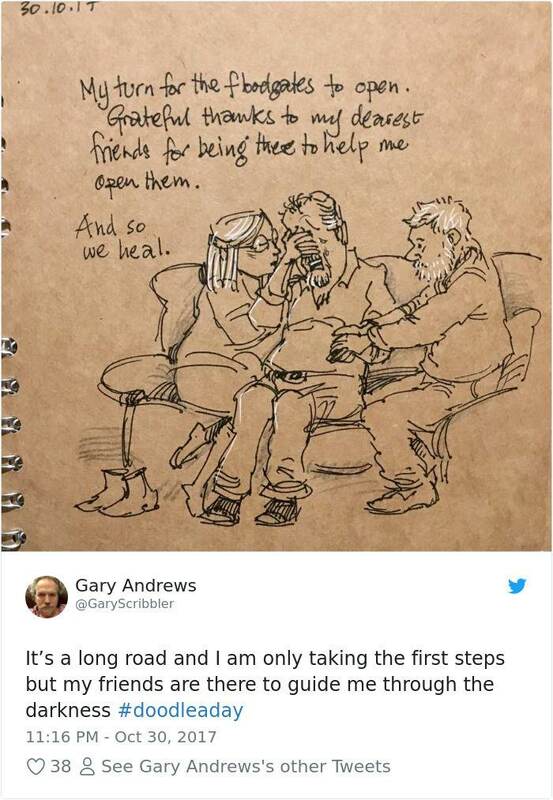 He is not angry at anyone for what happened to his wife Joy, but he rather wants to help doctors catch it quicker. 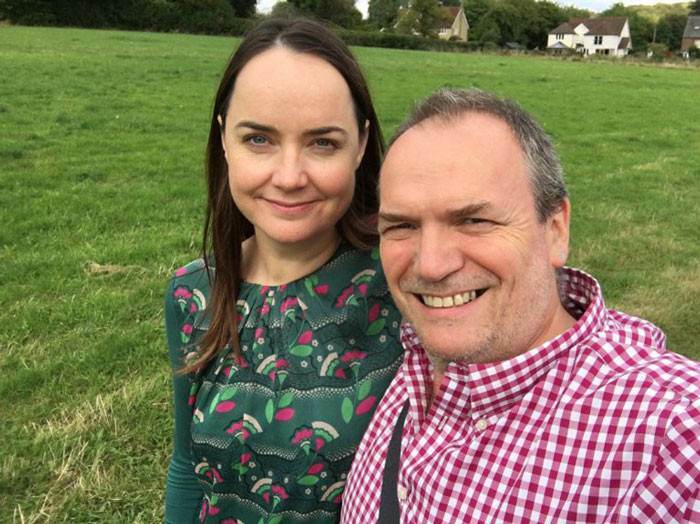 "From the minute Joy was admitted to hospital, specialists from every department tried to find out what was wrong," he said. 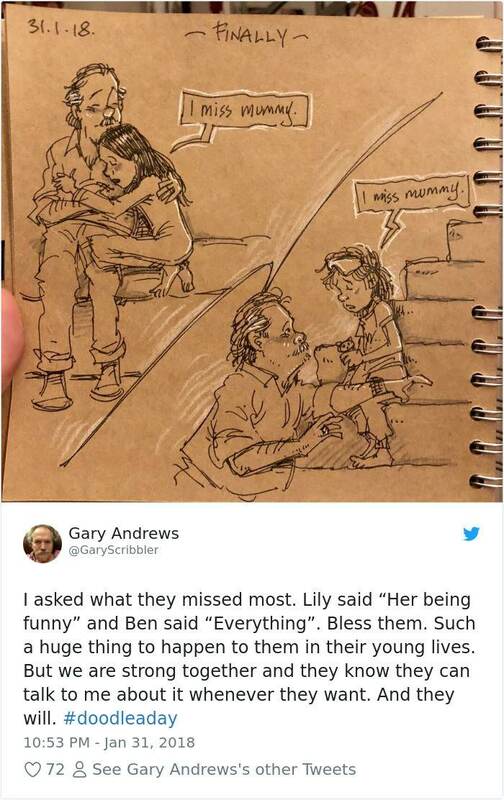 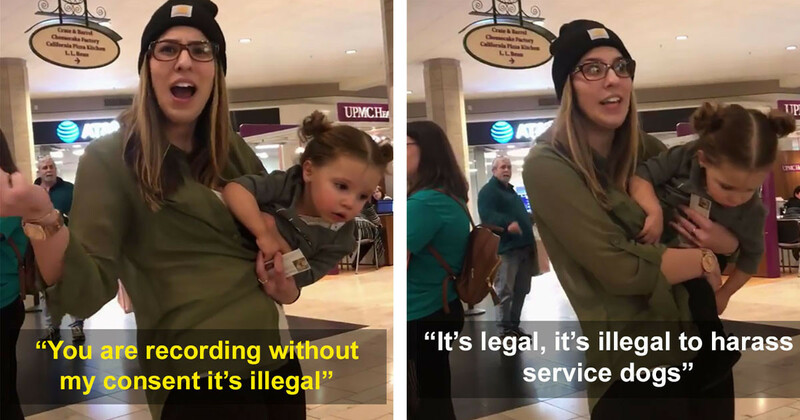 "They couldn't have done more. 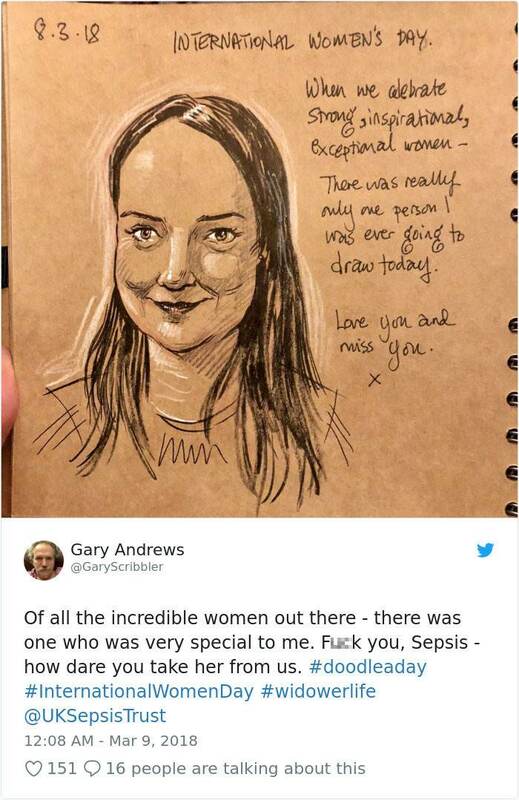 It wasn't until the post-mortem that they narrowed it down to sepsis." 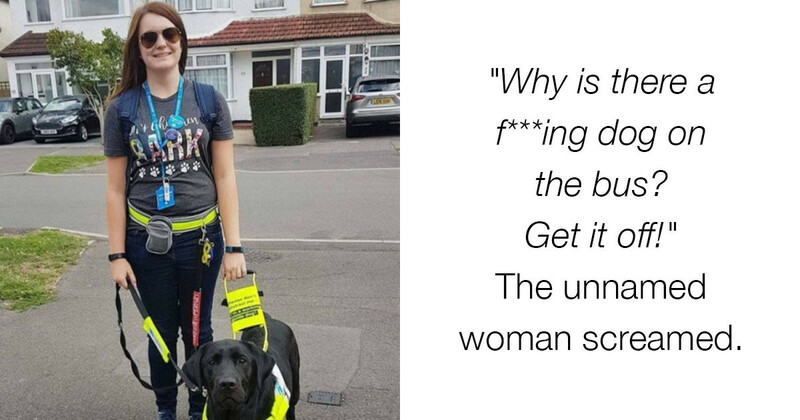 "Blame and 'what ifs' won't bring Joy back. 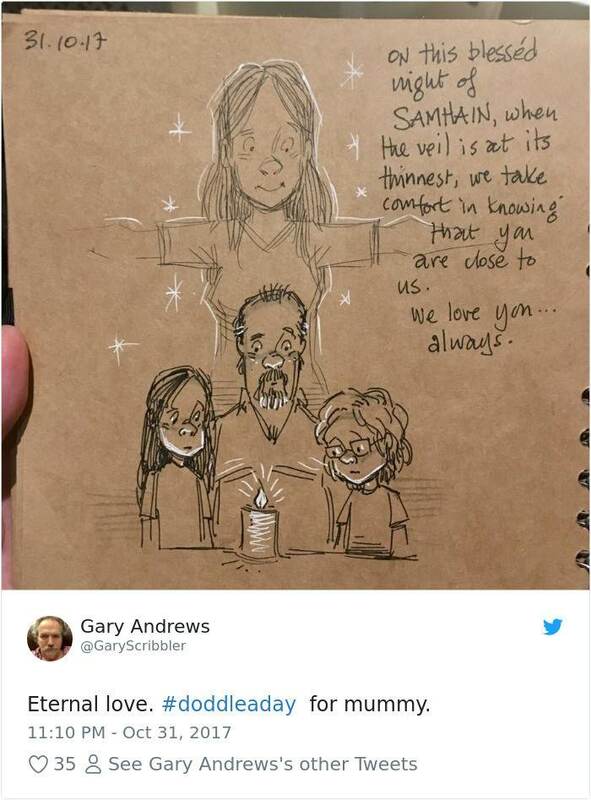 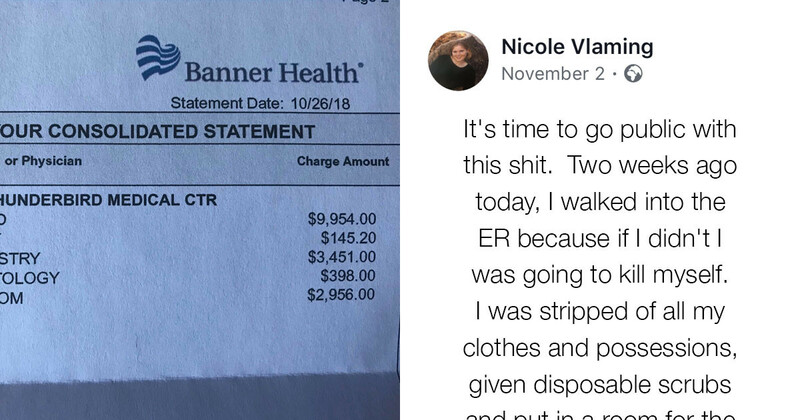 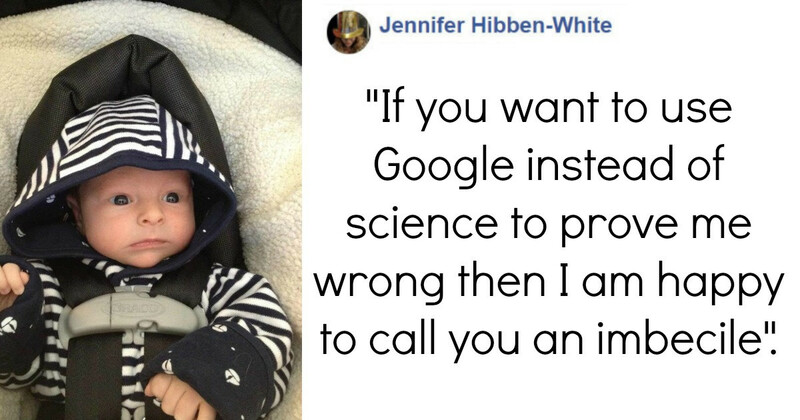 Would she still be alive if I hadn't been in Canada and a doctor had been called a day earlier? 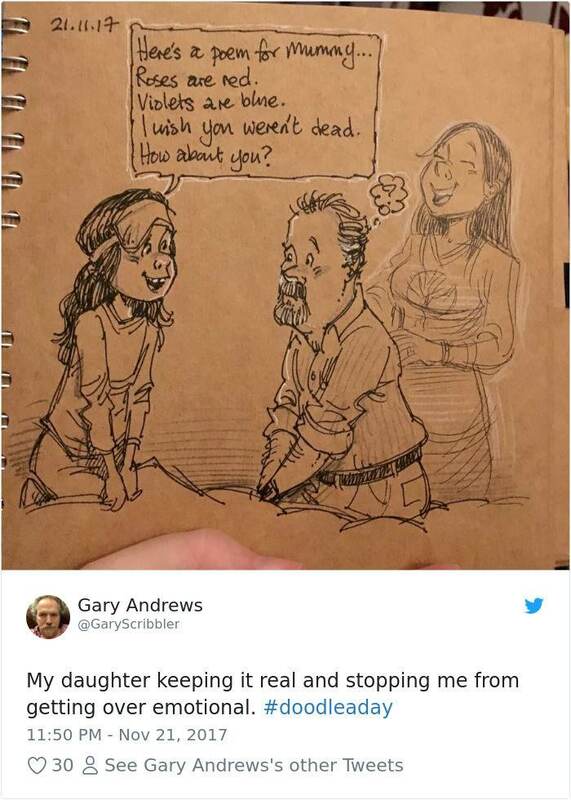 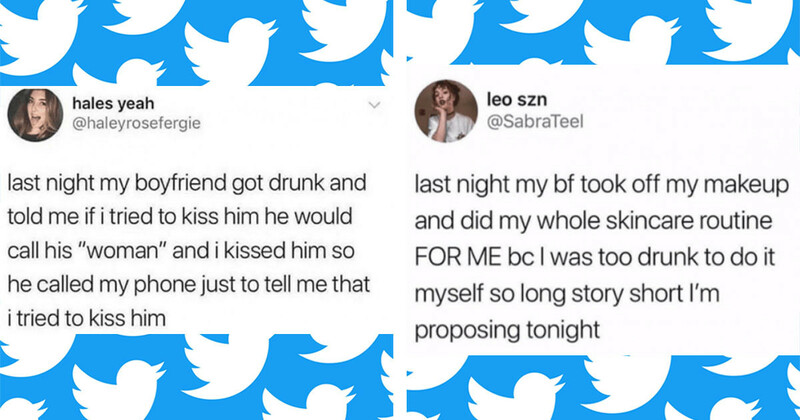 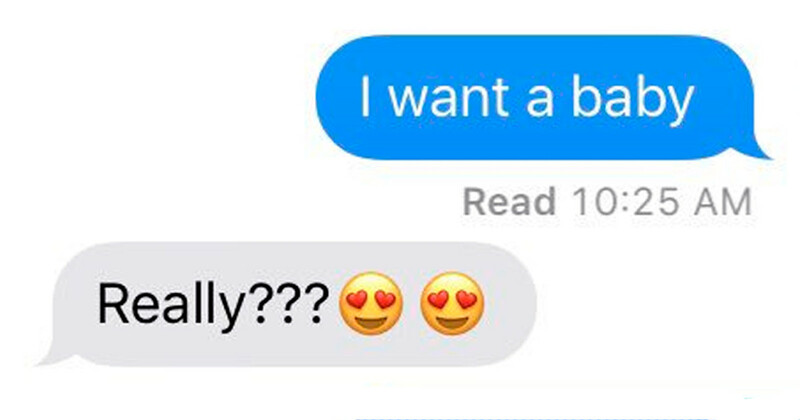 I can't think about things like that. 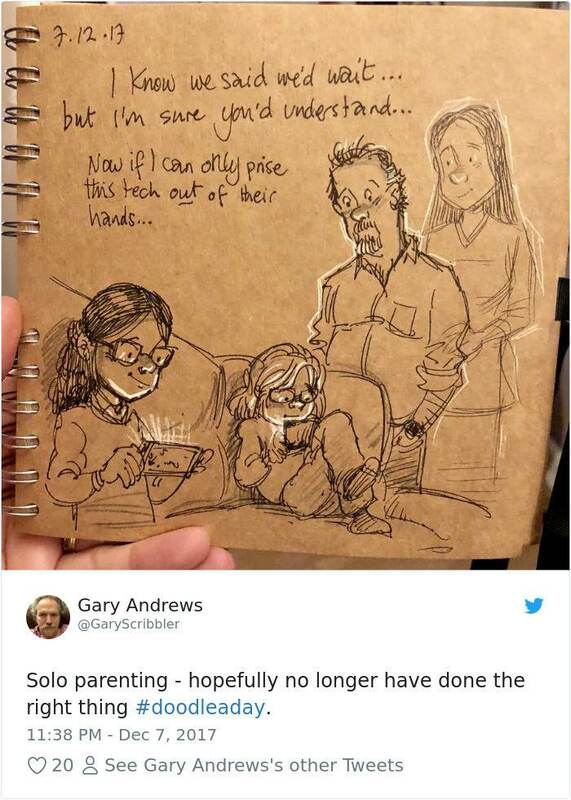 What happened has happened and you just have to come to terms with it. 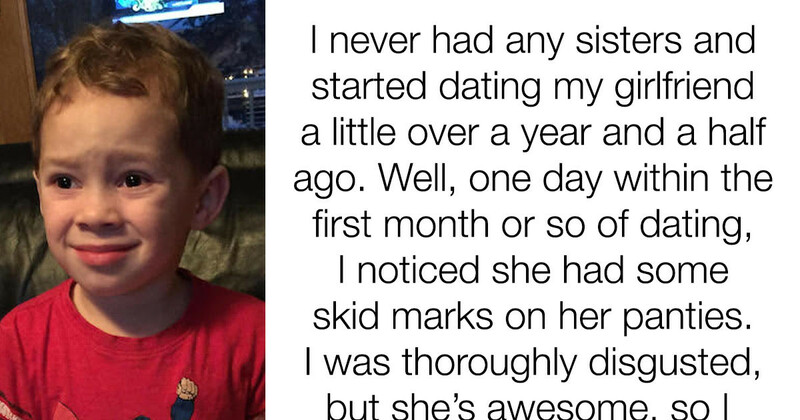 I just want to move forward, to honor Joy's memory and bring up our kids in a way she would have approved of." 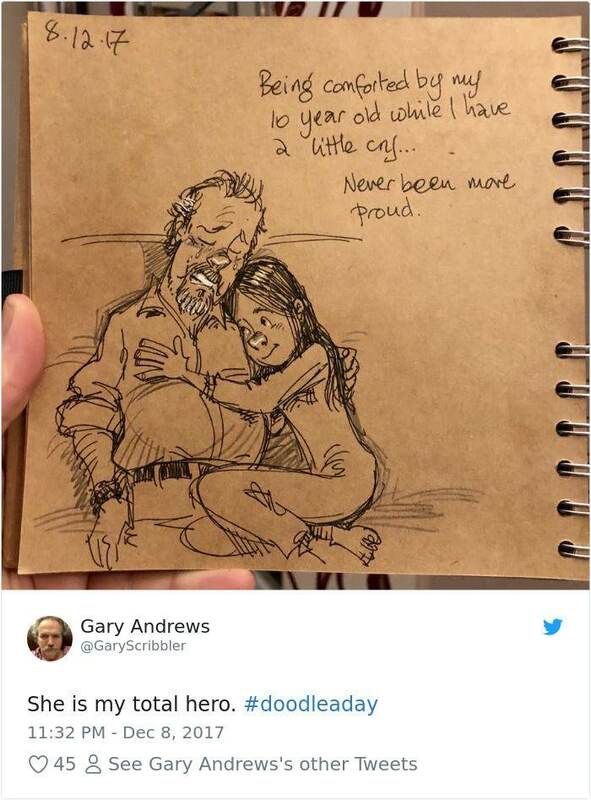 Have a look down below at some of his doodles and be prepared to get your tissues out. 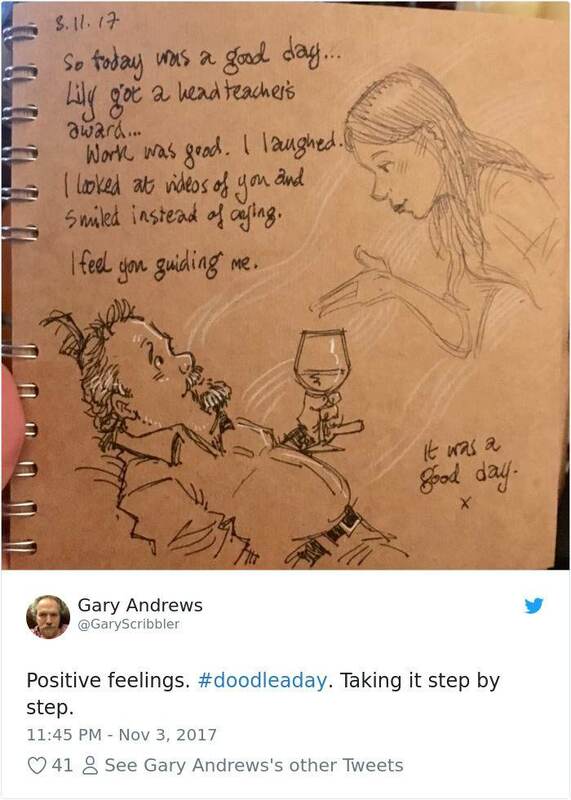 These are the doodles he drew to deal with his wife's death. 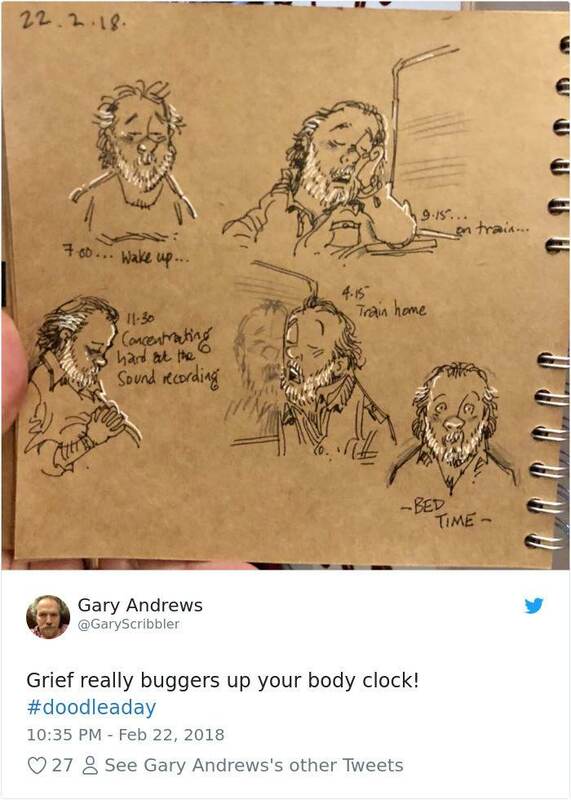 They say time heals all wounds, hang in there. 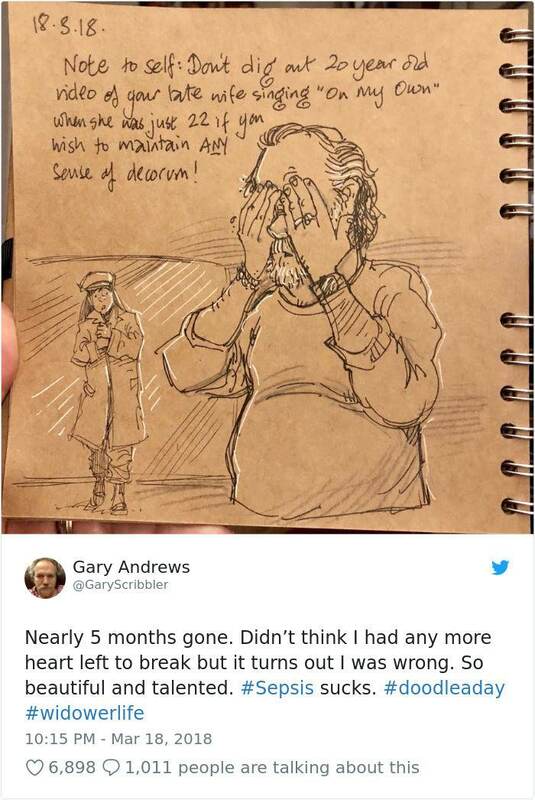 "Chips of the old blocks"